You can chose to undertake the packing yourself or you can let us do it. We can supply you with all the packing materials that you may require. 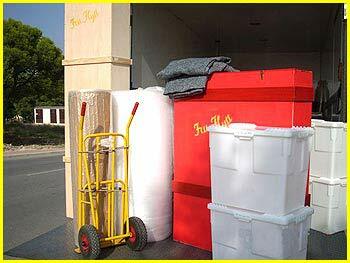 All material properly delivered in advance, so that you do not have to rush the packing. - Plates, bowls and saucers are packed in paper and placed on end in the box. In that way is cracks avoided, because of movements and vibrations. - Put something soft at the bottom. - Cups and glasses are packed in paper and layes down in the box. - At the packing of books, be sure not to pack the box completely up. Just fill up to half, add clothing and other light things on top. You can also choose to let us take care of the packing. You don`t have to care about furniture and other large objects. We pack these while we get the rest of the goods. We wrap in bubble plastic and / or carpets, so that we are absolutely certain that no friction injuries occurs on the road. We also use special picture boxes for art and mirrors. High cabinet doors with glass is usually difficult to transport. Therefore, we have special boxes made of wood, which we use to the cupboard doors and other high and fragile things.